I would first like to extend a word of sincere appreciation for the invitation to participate in this crucial gathering. Thank you also for acknowledging the role communities, especially our indigenous communities, can play in the repatriation of the remains of their ancestors. The phrase “repatriation of human remains”, in our current South African context, is usually associated with the return of the remains of our brothers and sisters who died for the cause of freedom and democracy. It includes those who died in exile, those who were killed by Apartheid forces and buried away from their families and the communities they came from. This was the line of thinking of many of us until about 15 years ago when we were made aware of another sad chapter in our history of our people. In the late 1990s the McGregor Museum in Kimberley invited a study by Martin Legassick and Ciraj Rassool, and it was this which brought to light in great detail the history of trade in human remains in museums. 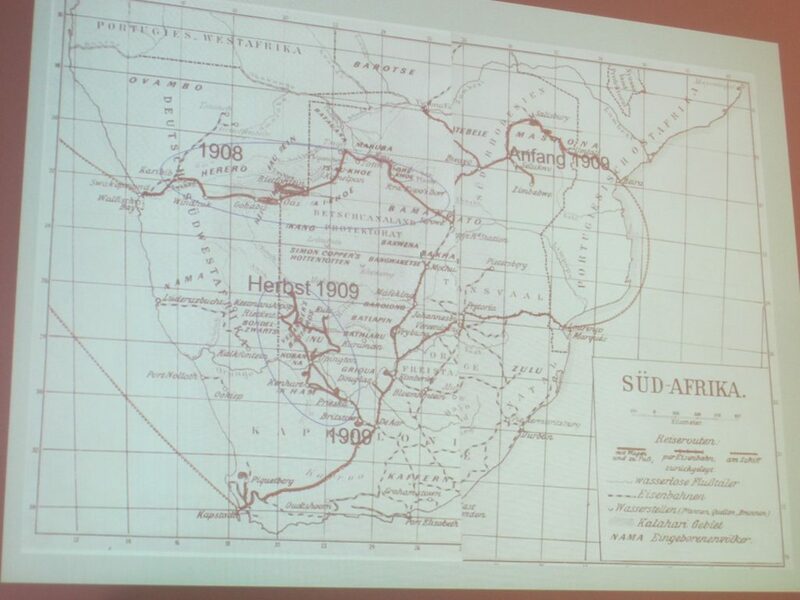 It also revealed the particulars about Klaas and Trooi Pienaar and the atrocities committed by Rudolph Pöch and his assistant Mehnarto on their expeditions through the Northern Cape. The study by Legassick and Rassool was published in 2001 and launched in Kimberley at a conference with Khoe-San communities to consult on the issues of human remains in museum collections. Through some strange twist of fate, I was told, news broke of the 9/11 tragedy in the United States. The conference adjourned before any consensus could be reached on the issue of San remains in collections. Years passed until late 2011 when we were informed that plans are afoot to return the remains of Klaas and Trooi Pienaar from Austria and to rebury them in the Northern Cape where they came from. I was fortunate to be part of the team, who, together with Ciraj Rassool and colleagues from the Department of Arts and Culture and representatives from the Khoisan community, had to facilitate the process of repatriation and eventual reburial. It was during this experience that we have learnt some invaluable lessons regarding the repatriation of human remains which I would like to share with you. One of the first lessons we have learnt out of this experience was that they were simultaneously victims of a driving agenda in science in their day and of prejudice. They were robbed of their freedom and dignity in life through colonial land dispossession, orchestrated genocide and eventually ended up being robbed from their graves in death for Pöch’s studies in racial science which set out to prove that people of color were inferior. Prejudice in South Africa had already for decades, indeed centuries, dismissed the San as primitive savages. Indigenous people had been categorized and stereotyped and, in an evolutionist scheme, it was believed by many that the San were a surviving relic of an early stage of human development. They were “living survivals of humanity’s infancy” as one scientist put it. In terms of that prejudice, the view that depicted the San as primitive and savage helped to sanction acts of genocide that were committed against the San. Even today, some San see themselves as peripheral, a people whose interest has been forgotten. We are all challenged to find a way to turn the atrocities committed to their ancestors into something with a positive spin-off for these communities. One of the important elements of the preparation for and the process of return and repatriation of the remains of Klaas and Trooi Pienaar to South Africa and to the Northern Cape in particular, was the identification of descendents or family as part of the determination of where the remains have to be returned to and where the location of the burial will be. Despite the efforts of the provincial department which have been systematic and extensive, some have described the results of these efforts as “interesting”, “uneven” and even “contradictory”. In an effort to locate descendants of the Pienaar couple, we approached the South African Commission for Cultural, Linguistic and Religious Communities for assistance. Through their provincial commissioner, we managed to make a presentation on Klaas and Trooi Pienaar during a gathering of the Khoisan community in Upington in celebration of Khoisan culture and traditions. Subsequent to the presentation, we were approached by a woman who claimed to be related to the family of Trooi Pienaar, nee Padmaker. Since the surname “Pienaar” and the names Klaas and Trooi were quite common in the area of Kuruman, many immediately claimed to be related to the couple with the expectation that some form of financial compensation will come their way. This led to quite a tussle about whom we should generally accept as either descendants or relatives of the Pienaar couple. In the end we settled on the claims of a Professor Abel Pienaar, who according to his family, has done research on the family history and its substantial presence in Pienaar’s Puts in the Kuruman district over many generations. He seemed to know a great deal about the importance of family continuity as reflected in its naming practices of repeating names after one generation. Without the presence of such an adoption of the children of Klaas and Trooi Pienaar in the narratives of their family’s oral history, it can be stated clearly and unambiguously that Professor Abel Pienaar and his family of the 21st century are not the biological relatives of Klaas and Trooi Pienaar. Biological family was one of different concepts of family that were presented at the final consultative workshop in Kimberley on 3 April 2012 and the family meeting with Department of Arts and Culture representatives on 4 April 2012. Moreover, notions of family history competed for attention alongside assertions of ‘ethnic’ and communal relations, sometimes presented as Khoisan and at other times as Bushman. The assertion of ‘Bushmanness’, as opposed to the more anthropological Khoisan or even San may have represented a reference to a class history as dispossessed people, and a move away from subjection by anthropology. 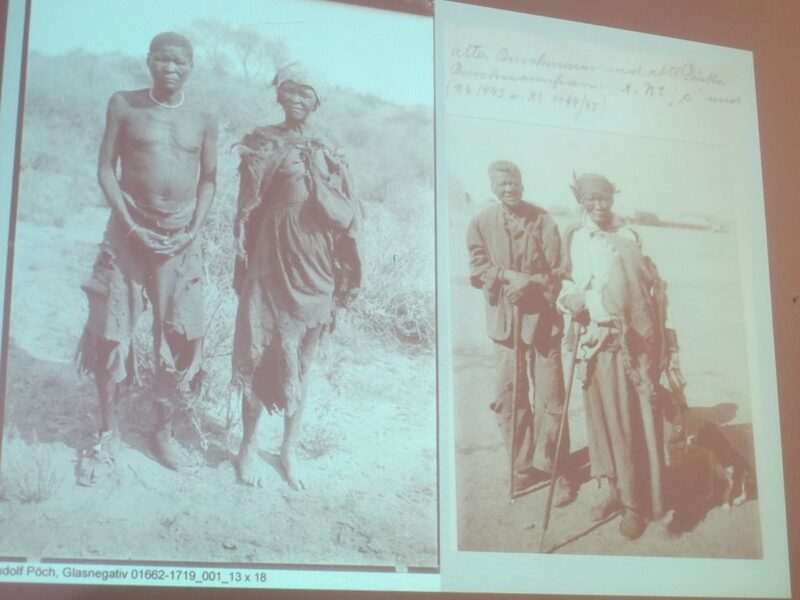 It became clear that as Bushmen, the graves of their dead relatives were vulnerable to theft in the service of a racial anthropology intent on harvesting the bodies and skeletons of 20th century people deemed to be fossils. By adopting “colouredness”, their dead in their graves had no anthropological value. By becoming coloured and concealing their language provided significant defenses against the threat of grave robbery, so fresh in family memory like the one committed by Rudolf Pöch and his assistants. How did we then respond to this prickly pear of a situation? Due to the heightened interest and the perceived elevated social standing among those who claimed to be descendants of the Pienaar couple, government took a position to treat them as “members of the community”. Even in his address at the official funeral, the President of the Republic (Jacob Zuma, editors’ note) referred to them as members of the community. We have learnt that where it is impossible to trace descendants of the human remains to be repatriated through measures other than DNA testing, the remains should be under the custodianship of the legitimate and recognized Khoisan structures. The next challenge lay with identifying the site of original burial on the farm Pienaar’s Puts. Maps of that period were scrutinized; we called for the assistance from the Office of the Surveyor General to research title deeds for the farm of that name. We consulted communities and traditional leadership currently staying in that area, but nobody could assist. As news spread that we were trying to locate the graves, many claimed to know the exact location. We followed up on these leads, even taking long hikes into rugged terrain to find Pienaar’s Puts, but to no avail. In the end it was decided to re-inter the Pienaar remains in Kuruman, the town closest to Pienaar’s Puts where they were originally buried. During all of this, critics of the repatriation project constantly asked, “Why are you not leaving them where they are? What benefit will their repatriation bring to the affected Khoisan community? To them we responded by saying that almost all indigenous communities around the world have a belief that the spirits of the dead cannot rest until returned to their country of birth. It also represented the need to reassert control of their cultural heritage. Given the importance attached to human remains by indigenous people, the South African Truth and Reconciliation Commission report relating to human remains, including cultural rights of the dead and the demand that the spirit of the dead, the “amadlozi”, be officially brought home and inaugurated as an ancestor, should be examined. In the process leading to the repatriation of the Pienaar remains, intense discussions were held with the South African Embassy to plan and strategize for the anticipated meetings with the Austrian government, and in particular institutions such as the Natural History Museum. 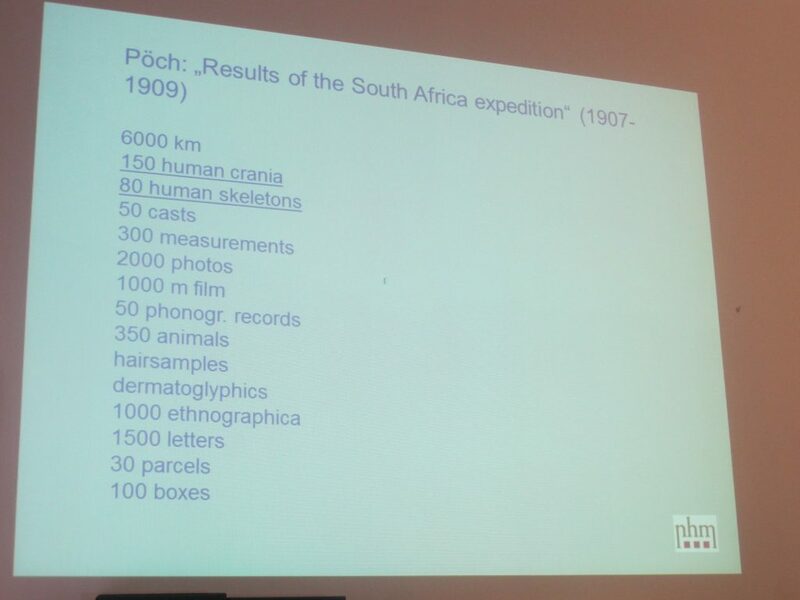 The meeting with the Natural History Museum really opened our eyes to the extent of the Pöch expedition to South Africa. Although it was initially indicated that they do not have knowledge of associated objects / goods, the inconsistencies were clear for anyone to see. The inventory presented was very telling. Dr. Teschler was uncertain when and how Pöch collected rock engravings. Yet they were on display at the Ethnographic museum. Somewhere, there is a comprehensive inventory. It is not possible for Dr.Teschler to have conjured up these figures. This should be the beginning of the inventory. South Africa should capitalize on this. It won’t make sense to claim victory on the return of two sets of remains and pretend that the 150 human crania and 80 human skeletons amongst others do not exist. It needs to be emphasized that these were South Africans too. We need to use their information to move forward. Our recommendation is that Dr. Teschler’s presentation be an anchor and basis for all the other work that needs to happen; including research; joint inventorying etc. Those 30 parcels and 100 boxes contained objects of value. In months after the re-interment of the Pienaar couple, the Northern Cape Provincial government engaged the San community, through their traditional leadership and organized formations such as the National Khoisan Council to evaluate the lessons learnt from the return of the Pienaars. Due to the extent of San remains in museum institutions across Europe and other parts of the world, the community felt that a focused approach will be crucial if we want to achieve success with the repatriation programme. It is their opinion that if a specialized unit is established, it should be adequately resourced by government and the countries in possession of the remains of San people. This institution should develop strict policies for the unconditional return of remains and artifacts to indigenous communities. It should also conduct appropriate and diligent research to identify the correct communities/custodians responsible for the remains. The community or custodians from the group or area from which the remains originated must be involved in deciding what happens to the remains. This unit should also be responsible to coordinate the repatriation of the remains of indigenous people in our museum institutions to their countries of origin. It is not only European Museums which are being taken to task for their collections of human remains, local South African Museums have similarly begun a process of introspection and developed guidelines on the sensitive issue of returning the questionable collections of human remains. There will be a need to either amend existing legislation such as the National Heritage Resources Act or to facilitate the drafting of a new Act which focuses exclusively on the repatriation of human remains from museum collections. Currently the NHRA states that all repatriated remains should be buried in the capital of the country. This contradicts our belief that the remains should be returned and buried in the communities they came from. In conclusion, some of us may have heard or know about the new university in the Northern Cape, the Sol Plaatje University. This museum, in due course will focus on Museums and Heritage Studies as a niche study area. This provides us with the opportunity to broader areas of collaboration between the European museum institutions and the Northern Cape, in particular research, capacity building, and the development of curriculum content. 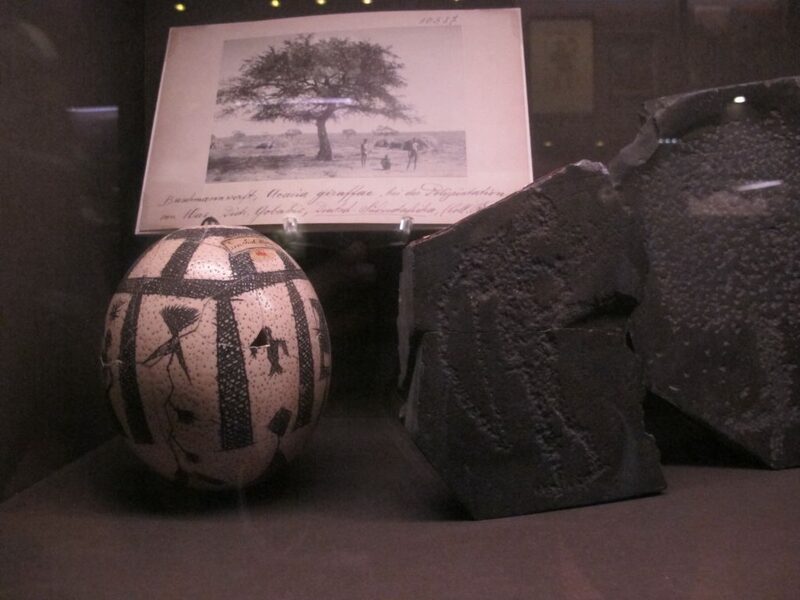 Apart from the fact that the homecoming of Klaas and Trooi Pienaar is viewed as the first step in having all South African cultural artifacts returned, it now also places an increased responsibility on our shoulders to speed up this process and insist that the agreement to establish a Memorandum of Understanding be implemented without delay. We need further research and joint inventorying of collections. The Austrians agreed that they do not have provenance on most of Pöch’s collections. As such, the availability of research assistants in the form of post graduate students can help in this regard. We recommend a team be established to accomplish this task.